Who Rocked It Best: Rihanna or Jada? Both Rihanna and Jada Pinkett Smith were spotted wearing the same animal print Pucci dress. Now we ask, who rocked it best? Click through to vote... Here's what you had to say: LaTonya commented via Facebook: "I'm going with Jada." Mattisa wrote via Facebook: "I like Rihanna's shoes better." 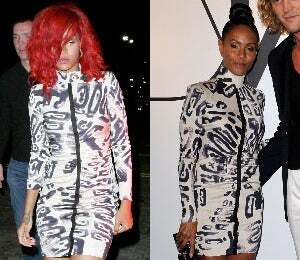 Both Rihanna and Jada Pinkett Smith were spotted wearing the same animal print Pucci dress. Now we ask, who rocked it best? You decide.